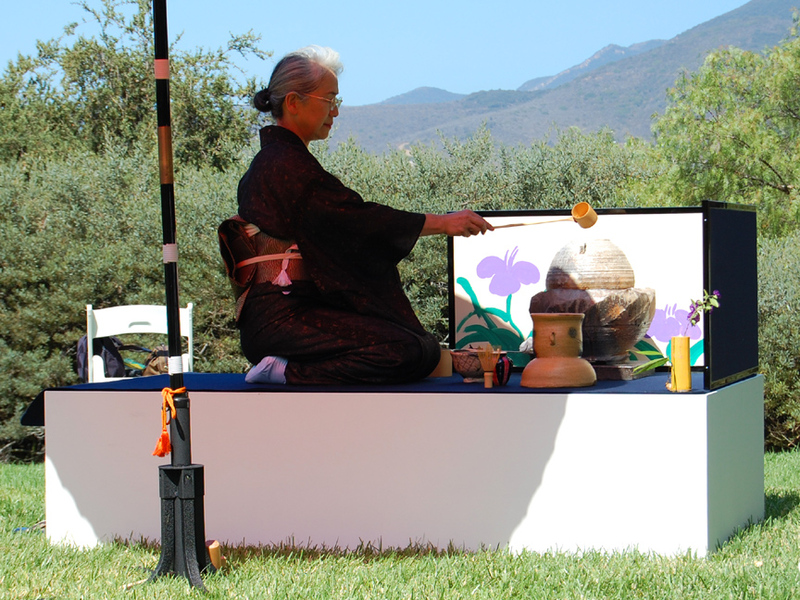 Malibu might seem like a strange place for a traditional Japanese tea ceremony. 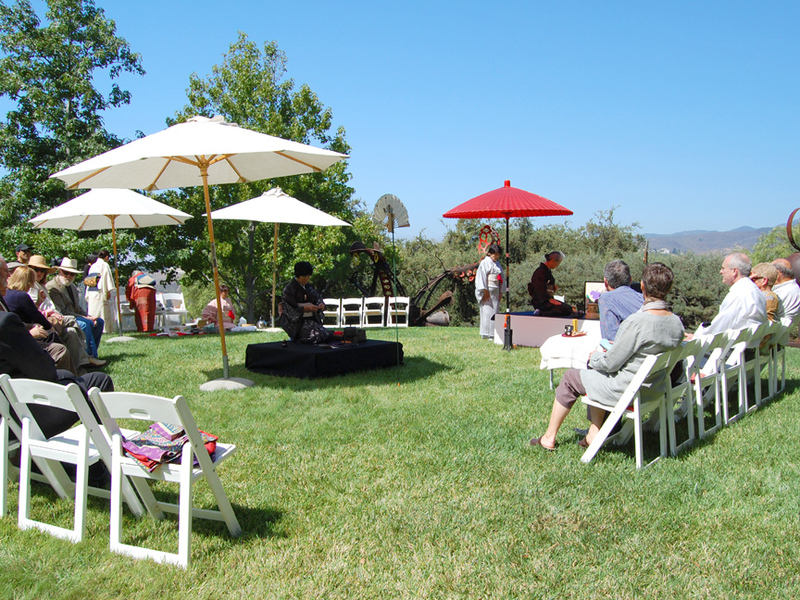 But last Sunday, Goro Suzuki and I hosted almost 60 guests for green tea overlooking the blue Pacific—about five miles north of the famed California beach town. 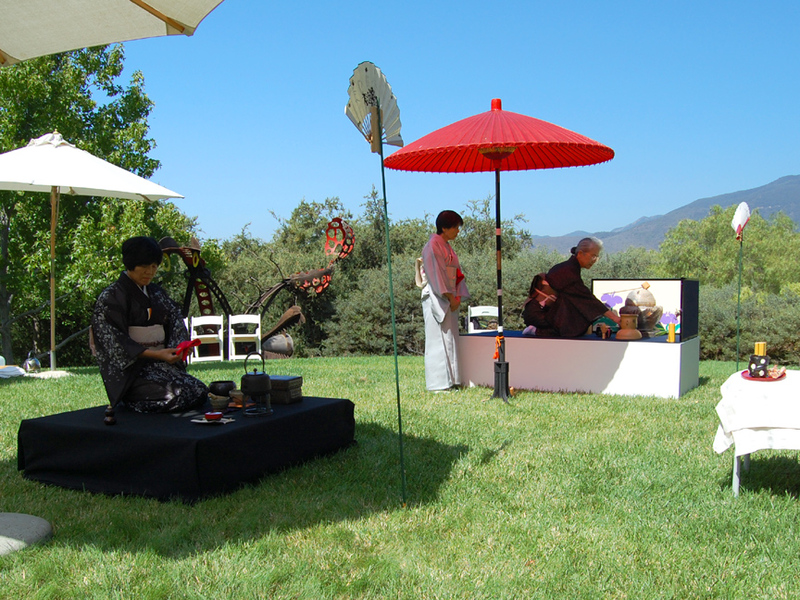 With an idyllic setting on a grassy knoll, and the help of a true Tea Master, we offered a way to experience a true Japanese aesthetic ritual. It was an amazing day, and I learned a lot. The idea for the special event came from the artist, Suzuki, and he made sure that all details were taken care of properly. Tea Master Souyu and her six assistants were all flown to Los Angeles from Japan. All of the ceramic wares used in the ceremony, from the cold water jar (mizusashi) to the tea bowls (chawan), were made by Suzuki. 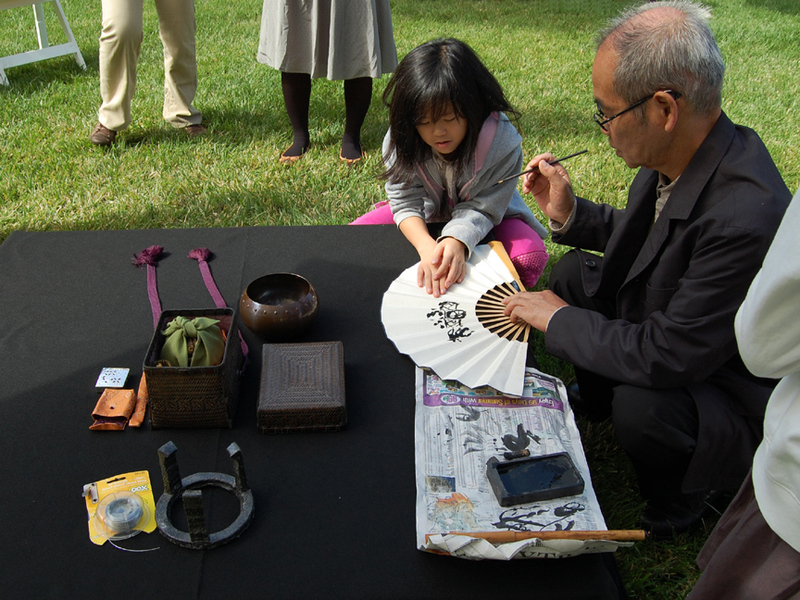 All of the utensils, such as the bamboo whisk (chasen) and the tea scoops (chashaku) were selected by the Tea Master, and brought directly from Japan. Even a special wood ash, (used to form a spot for the charcoal in the brazier), was selected and imported by Tea Master Souyu. In the days before the ceremony, we witnessed some of the preparations, as the special platform was set up and the objects arranged at the gallery. Of course, if our tea had been served in a traditional Japanese tea house, we wouldn’t have seen the many behind-the-scenes tasks. But it was amazing to watch the time and care that went into preparation. Every small detail was educational for me, since I am a beginner. Sunday arrived with perfect weather. The day was clear, warm and slightly breezy. On top of the Malibu knoll, surrounded by the coastal mountains, we basked in the open light of Southern California. 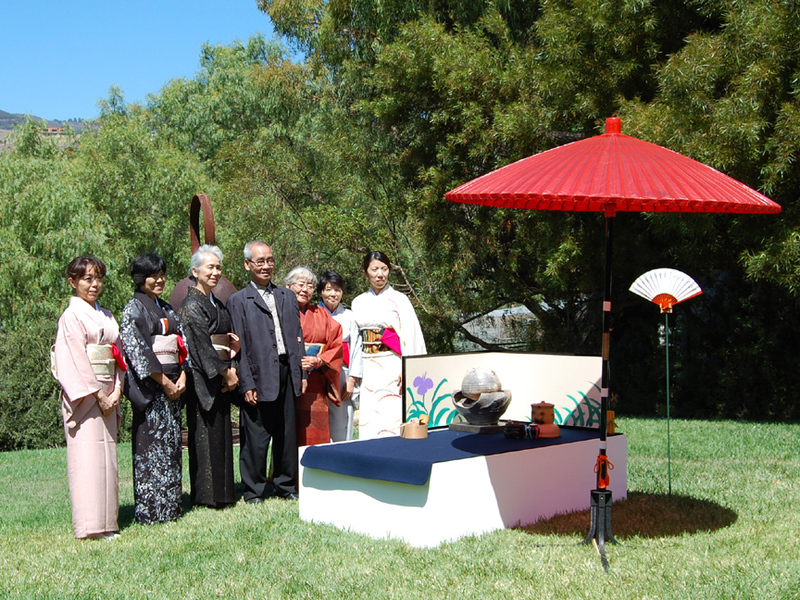 Before the ceremony began, Suzuki painted two folding fans with Kanji characters, and placed the fans in front of platforms, facing the guests. The Tea Master and her six assistants silently performed their tasks. Washing and wiping the bowl and the whisk, they carefully unfolded and folded the linen cloths (chakin). Each guest was invited to be seated, and to take some of the sweets from the serving dishes. The thick, strong green tea was served in an extraordinary array of traditional and non-traditional bowls. 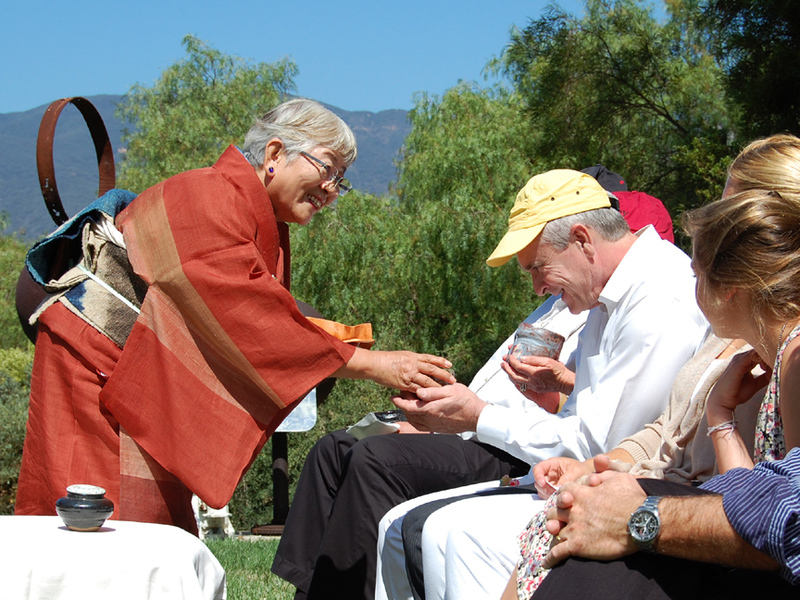 Every guest was served by the assistants dressed in kimonos—with a very courteous bow. Our day was completed with a special bento box lunch prepared by Chef Hiro Nishimura. 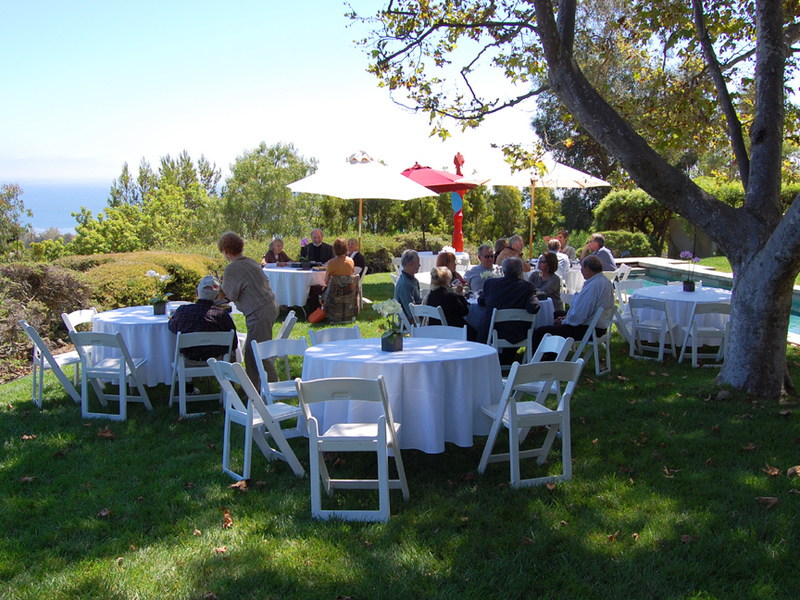 Guests gathered around tables on the south lawn, overlooking the coastline.